The first set ECL01 is very feminine with a lacy theme and the second set ECL02 is based on Nordic Christmas knits. Both have a simple graphic style/feel and would work perfectly for CAS or what I call arty cards but are equally as handy to have in your stash for mixed media projects. 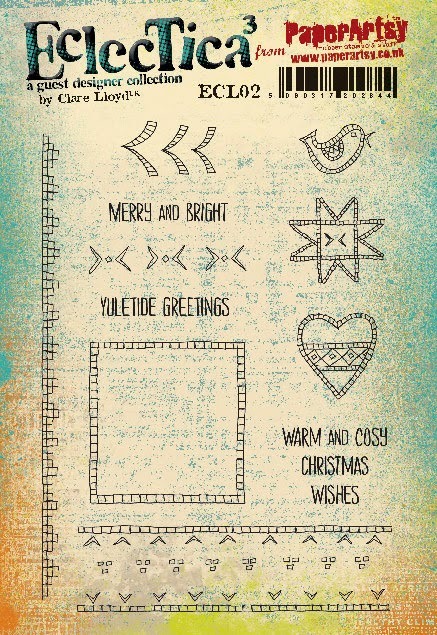 I will be sharing more projects I have created using my new PaperArtsy Eclectica stamp range over the coming weeks both here on my blog and of course over at PaperArtsy. 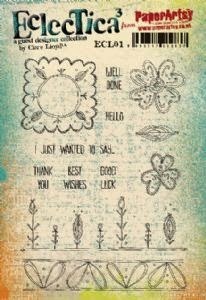 All new release stamps are now available from your favourite PaperArtsy retailer. Many congratulations on your success. Popped over from Kathy K's blog. Congratulations, Clare! I love them, I can see endless possibilities of using them! Clare yesterday, Sunday, we held a retailer training day, and the retailers I taught a class to with your stamps LOVED your designs!! They couldn't say enough nice things about them! Went down an absolute storm! Well done! XXXX EXCITED MUCH!!! Clare, I attend the retailer day and ADORED your stamps! Thank you for popping by my blog and seeing the tags I made with them - I couldn't resist using them first as they are so versatile! More please!! !